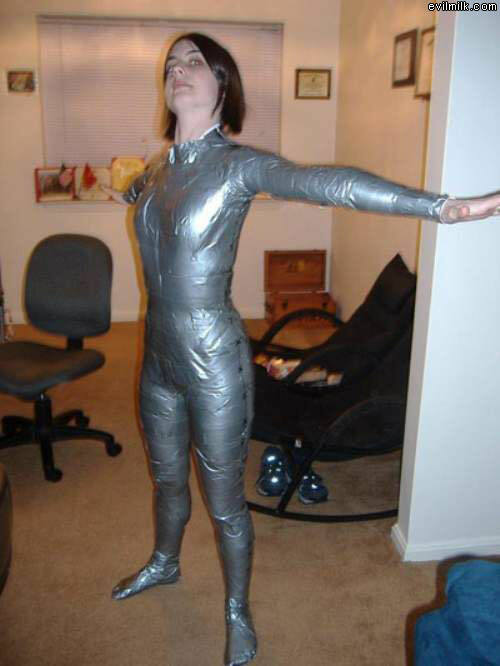 You’d be amazed at what duct tape can achieve… I’m sure someone could create… awesomely awesome things. I always KNEW it was magical. And now a web-comic has confirmed it. But I would like to think that as magical as duct tape is, it can’t hold the mighty force that is Monty. –> Is the Middle-Lower strip acting as a Censor Bar, as it would with Rayne of LICD? The first picture…wow. I wonder if she’s wearing clothes under that, or if they just duct taped her skin. Because that would HURT! I think that what they did (or what I would do) is not have clothes under but wrap duct tape on sticky-side out, then wrap sticky-side-in duct tape around that. However, the bikinis appear to be just stuck to skin straight up. those things wouldn’t stay on without adhesive. Does Monty have s super-powered evil side? And to think that duct tape is underrated these days. A suit out of duct tape is just ridiculously epic. And I recall Monty having claws – which he could poke through the duct tape and wrestle free with? More importantly, I’m totally looking forward to the aftermath of this duct tape debacle. Clearly because Monty will lose a lot more than just fur. Well if Mythbusters did anything for my beliefs in duct tape, this only confirmed my convictions! Monty always looks so damn adorable, it’s NO WONDER he’s #1! haha he’s not number one yet (I hoep one day he can have that slot! Monty is the number 1 sidekick of all time! I had a brief fascination with duct tape in high school and ended up with duct tape pants and a ton of wallets. Too bad they get all gooey after a while, though. Yeah, but I am sure tons of people have done it. but if you are! This totally reminds me of something that happened to Pint-Size. Anywho, I just discovered this comic this other day and I absolutely love it. whoops! didn’t notice someone already commented about it. my bad! He’s going to pay for that latter.